To view the mayhem on YouTube from your Droid X, or to contribute something yourself, use the YouTube app. Like all apps on the Droid X, you can find the YouTube app on the Applications Tray (which you access by touching the Launcher button on the Home screen). 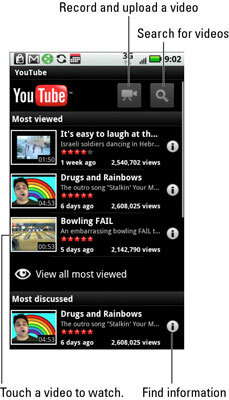 Use the YouTube app to view YouTube videos instead of using the Browser app to visit the YouTube Web site. To search for a video: Touch the Search button, then type or dictate what you want to search for and peruse the results. To view a video: Touch the video’s name or icon in the list. Remember, not all YouTube videos are available for viewing on mobile devices. Videos in the YouTube app play in Landscape mode, so tilt your phone to the left to see the videos in their proper orientation. The videos take up the entire screen; touch the screen to see the onscreen video controls. Press the Back soft button to return to the main YouTube app after watching a video or if you tire of a video and need to return to the main screen out of boredom. Press the Menu soft button and choose My Account. Your account information, your videos, and any video subscriptions appear.